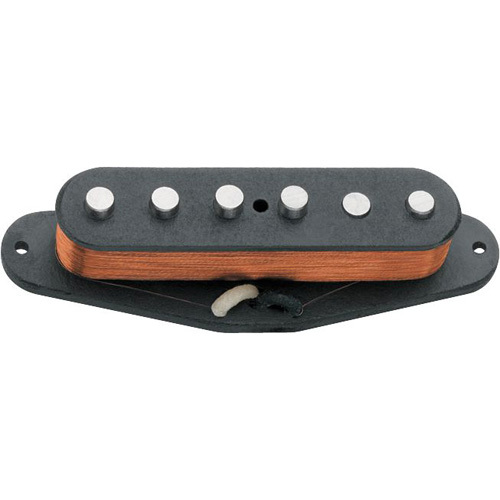 The Seymour Duncan SSL-1RwRp Reverse Wound / Reverse Polarity Vintage Staggered Pickup is an exact replica of the original Alnico V Stratocaster® guitar pickups. The same type of magnet wire is used, as well as the same number of coil windings. The staggered rod magnets are hand-ground, then aged by the exclusive Dun-Aged process. Lacquered bobbins and cloth-braid hookup wire complete the vintage look. Every detail is included to duplicate the bell-like tone and the high-end bite that made the vintage Strat® pickups famous. With the Reverse Wound / Reverse Polarity it provides hum cancelling when your 5-way switch is in positions 2 and 4. Perfect for that vintage Gilmour tone. The SSL-1RwRp does not come with a pickup cover.